We here at Arctic Spirit Rescue are big fans of the television show Parks and Recreation. Two of the characters, April and Andy, have a three-legged Pit Bull named Champion. We love the fact that a special needs dog is showcased in such a popular setting! Champion’s owners are hilarious, but, although they love him unconditionally, they don’t always make the best decisions as dog owners. We find this happening on TV shows and in the movies; situations involving animals are not portrayed very realistically for the sake of the story. Let’s take a look at some of the things we, as a rescue, do and don’t do with a little help from our friends in Pawnee. In one episode of Parks and Recreation, there is a large dog adoption event in one of the local parks. This is a great thing to do for the dogs, but the adoption process is much more complex than as seen on the show. In real life, you do not just get to pick a dog, pay a fee, and leave. You must first fill out an adoption application. Once that is approved, one of our members will come and inspect your home to make sure it is a dog friendly environment. If you have other animals, we will need to set up a “meet and greet” with the potential adoptee and your animals to make sure they will get along. If everything checks out, then you get to take the dog. Sure, it is a lot more complicated than just saying “I’ll take this one!” and walking out, but this way we ensure every dog is going to a good home where he/she will be safe and happy. In another Parks & Recreation episode, Andy decides to let Champion off his leash to roam free. This really is not a good idea. Dogs should only be let off their leash in a fenced-in area or else they may run off! They want to go explore, smell everything, and go crazy. Let them off the leash and they probably will not come back, especially if you have a northern breed! Even the best trained dog will run if they see a rabbit, squirrel, or other tempting critter to chase. Champion’s return later in the episode is Hollywood fakery and most situations like this do not end well. We require that our foster homes and adopters have a fenced-in yard and that dogs stay on a leash at all times when they are not in an enclosed space so this does not happen. Andy is incredibly lucky Champion came back safe and sound. Earlier in the same episode as above, Champion was being baby sat by Chris. When Andy came to pick him up, Chris told Andy that he took Champion to the vet, the pet store, and to an obedience class. This implies that Champion had no prior vet care when he was with Andy and April. That is not responsible pet ownership! You should always take your dog to the vet at least once a year for the same reason your doctor requires yearly check-ups: to make sure everything’s okay! 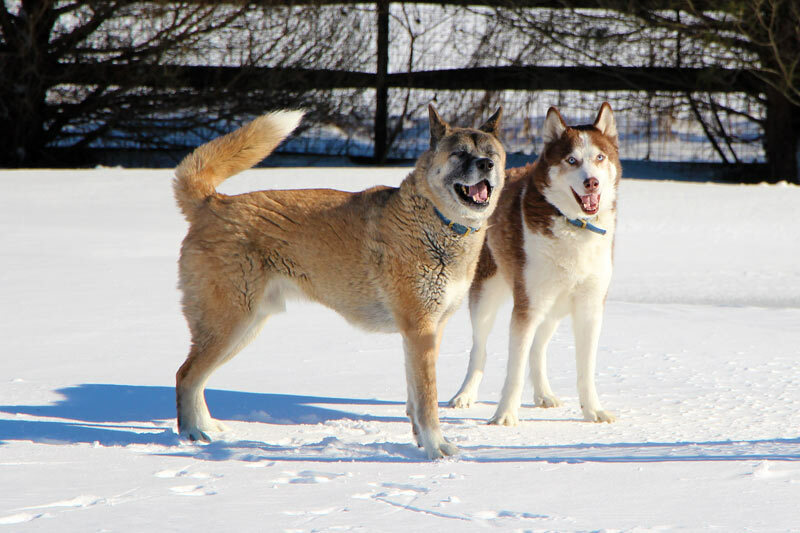 Here at Arctic Spirit, our new foster dogs will be taken to the vet for a check-up and will receive a rabies and other required vaccinations. Rabies vaccinations are required by law in all states! Always be sure to take your pet to the vet on a regular basis to keep them healthy. Adopters are encouraged to continue using the same commands, and even enroll in classes themselves. Training is a great way to bond with your new family member. On Parks & Recreation, April and Andy might not be the best dog owners, but they do love their three-legged dog so much. Here at Arctic Spirit, we love our dogs too and will do everything we can to keep them happy, healthy, and safe while they wait for their forever home! If summer winding down means back to school time for your family, it likely also means a change in your dog’s routine. No more kids to chase. No balls to fetch. The pool is closed. 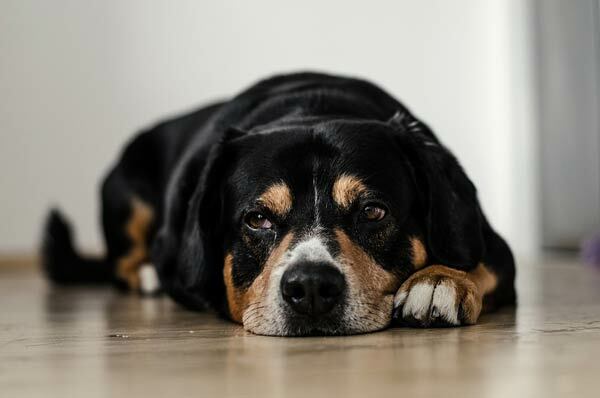 Your dog becomes lonely and bored. As many of us know personally, exercise is a great way to relieve stress and anxiety, and it’s no different for dogs. So add a morning walk or Frisbee toss, or maybe hire a dog walker to break up the day. And don’t forget the mental stimulation. Clicker training your dog some new tricks or brushing up on her manners will keep her mind busy. Still feeding your dog out of a bowl? Ditch it and replace it with fun, challenging food puzzle toys. 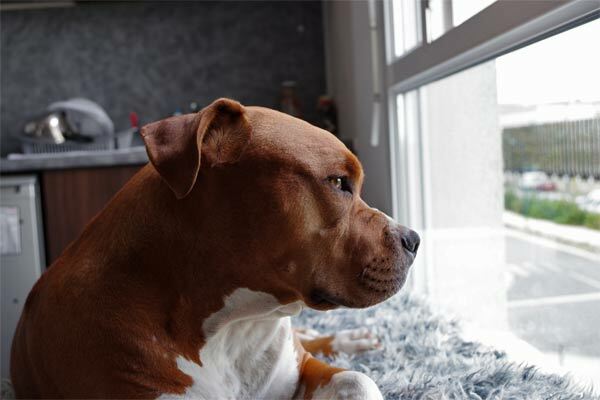 Background noise helps mask outside sounds that may further increase a dog’s anxiety. Leave the radio or TV on so your dog hears a human voice throughout the day. Through A Dog’s Ear is music specifically designed for a dog’s hearing, and has been clinically shown to calm dogs. It’s not too late, but don’t wait. What you invest today will show dividends in the future. Set your dog up for success and reduce everyone’s stress. Jeff Dentler, a Certified Professional Dog Trainer (CPDT-KA) and Certified Trick Dog Instructor (CTDI), provides dog training and behavior modification to residents of the greater Pottstown, PA area. Contact Jeff at jeff@DentlersDogTraining.com or 610-505- 0123. For more information and daily tips on training, exercise, health, and nutrition please visit DentlersDogTraining.com or follow them on Facebook. 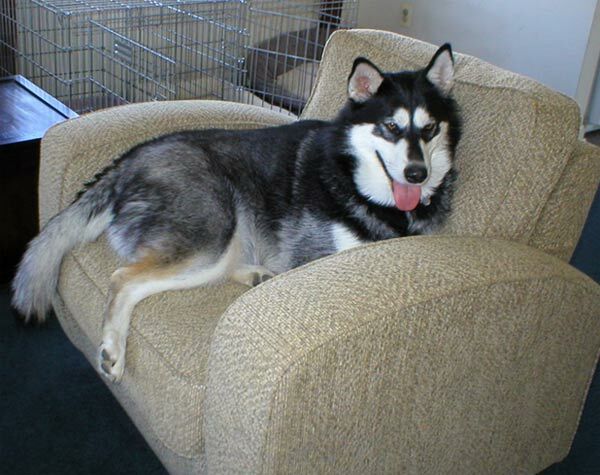 Kato is an 18 month old Siberian Husky mix who has spent too much of his young life in a shelter. He had been taken to the shelter, adopted, and then returned just a few months later. During this second stay in the shelter, Kato began to show signs of depression. Each time he was visited by Arctic Spirit Rescue volunteers, he seemed increasingly disinterested in things happening around him, was not eating his food, and did not respond when talked to. Even though the shelter staff loved Kato and took great care of him, our volunteers knew he needed to be in a home so that he could start to feel better. The decision was made to make Kato Arctic Spirit Rescue’s very first foster dog! As soon as Kato walked into his new foster home, he was an entirely different pup! This sweet boy loves to play and snuggle with his foster brothers and human family. He is completely housebroken, and knows how to sit and give paw. Sadly, all of the moving around and uncertainty in his young life have left Kato with some anxiety issues when he doesn’t know where his people are. He is a true velcro dog and follows his people around the house to make sure he doesn’t get left behind. Kato will happily go to his crate at mealtimes, but becomes upset when he thinks he’s all by himself. Hopefully the security of his foster home will allow him to become more comfortable in his crate when he has to be home alone. Like any young Siberian, Kato has lots of energy to burn, enjoys playing and wrestling with other dogs his size, and still has the puppy crazies – zooming around the house at top speed just because it’s fun! He is a very smart little guy, who manages to make just the right amount of mischief with his foster brother and partner in crime. Tissues need to be shredded and toys need to be broken right? And, of course, holes need to be dug in the yard. Kato’s foster family is still working with him on his anxiety issues, and some other basic lessons like How to Walk on a Leash. 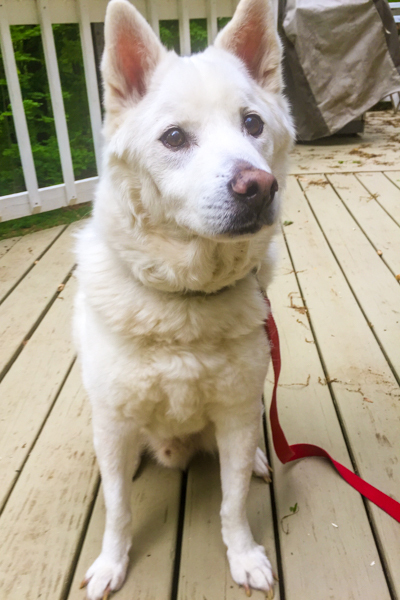 When he is ready, Kato would love a forever family with another energetic dog of his size to play with, and with people who have experience with Siberian energy and intelligence. Follow Arctic Spirit Rescue on Facebook and Twitter to stay up to date on Kato’s progress. Interested in adopting Kato? Stay tuned for details on how to apply for adoption! We started before we began! We knew when we started that before we rescued our first dog we would spend a lot of time and do a lot of work to launch Arctic Spirit. After all, we wanted to do it the right way from the start. And until our website was operational, we really couldn’t do much- or so we thought. 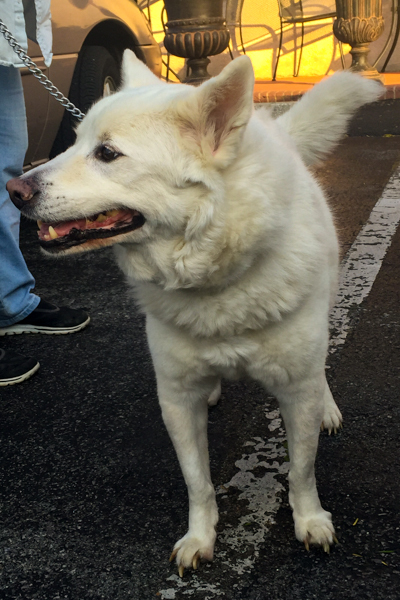 As it happened, Ron (our treasurer) was driving home from the pet supply store one Sunday afternoon and spotted a dog running loose on busy West Chester Pike. He followed it into the parking lot of a local restaurant, and the dog came right to him. Finding that it was wearing only a collar with no tags, there was no other choice but to bring him home. He called ahead to say he had picked up a lost dog, and I was ready with a leash and water. 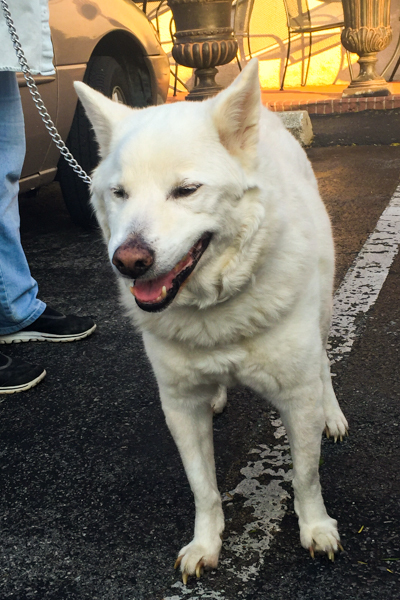 Out of the car jumped our beautiful new friend– a white coated American Eskimo breed mixed with maybe Shiba Inu. Sweet and friendly with charming black eyes. Clearly he was a beloved pet who had simply lost his way. As luck would have it, we scanned him with Arctic Spirit’s only microchip reader, and a number appeared in the scanner. The nice people at Avid reached out to his owner, who called us immediately and arranged to meet us at the same restaurant parking lot, which is near her home. Alberta was waiting, thrilled to get her baby back, and she shared with us his remarkable story. He was rescued in Okinawa by her son while serving in the U.S. military. His paperwork when bringing him to the United States named him “Pending Montgomery” and he happily goes by “Pending” to this day! The American hero suffers from PTSD, and Pending’s gentle nature helps to calm him. However, Alberta- who cared for Pending while her son struggled to overcome the PTSD- fell in love with him and missed him terribly when he went home with his daddy, so now he is shared by them jointly. When not helping an American patriot recover from the stresses of serving his country, he is providing love and companionship to his mother. We shared stories about northern breeds and their wonderful spirits, and gave her our number in case she ever needs our support. And so, before we even officially launched, Arctic Spirit Rescue was open for business! We know that there will be many more stories, and many more dogs will find us when they are in need. Ready or not, we will always make an effort to do what we can. We hope Pending’s story will help encourage others to microchip their animals. A collar with tags and a microchip are the two best ways to help your pet find a way home if ever lost. In-car temperatures rise quickly! Infographic created by Petplan. 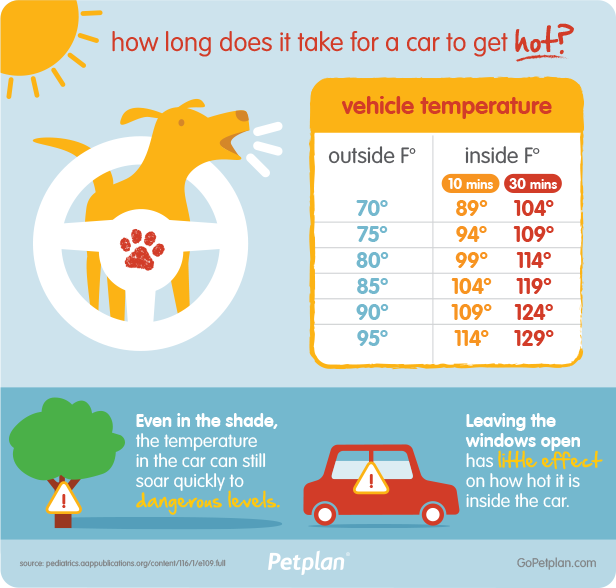 Parking in the shade or leaving the car windows open does very little to keep your pet cool. Some people rely on remote start to keep the car running, however what they also don’t realize is it sometimes deactivates if the keys are too far from the car and it generally shuts off after ten minutes. The danger of heat stroke occurs even more quickly for short nosed breeds as well as breeds with long, thick coats or young puppies. With just 15 short minutes of suffering organ failure, seizures, coma, or even death can occur. It’s difficult for anyone to get out of a grocery store within 15 minutes so that “quick trip” can easily turn into a nightmare for everyone. We encourage everyone to be vigilant and educate those who may not understand the risks. Have a safe and comfortable summer enjoying the weather with your furry friends! Be sure to follow us on Facebook and Twitter to learn how you can spread the word to make sure no dog is left in a car unattended. Hi, everyone! Lucy here. With the weather rising to unbelievable temperatures with sticky humidity these days, I wanted to tell you a story about my little brother, Kosmo. Kosmo went to the Rainbow Bridge last summer, so it’s up to me to pass on this important information. It’s summertime where I live and it’s HOT. As you know, we Malamutes and Huskies do not like the hot weather. Please don’t shave us, though! Believe it or not, our fur helps keep us cool and protects our skin in the summer, just like it helps keep us warm in the winter. Anyway, in his search for a nice cool spot, Kosmo learned that those metal rectangles on the floor actually blow out cold air! So, Kosmo immediately chose his new favorite spot to nap in during the summer. 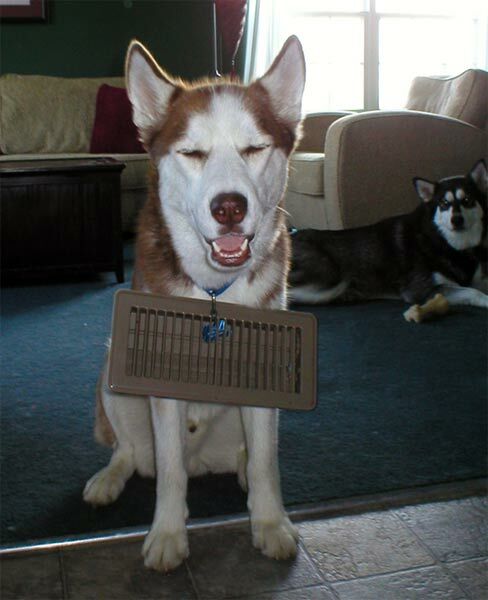 Then one day he decided he would try to carry the metal thing around with him so he could keep cool wherever he went. He was clever! Mom said no, however, and took the metal thing off his collar to put it back on the floor. It was a good idea by Kosmo, I thought. Maybe some of you will get lucky and your Mom or Dad will let you carry yours around so you can stay nice and cool all the time! When people hear “We help run a Dog Rescue”, the image that comes to mind is probably pretty simple. A lost dog. How hard can that be? Bring them home, feed them, hopefully find someone to take them, mission accomplished. They probably picture a doggy version of a “Cat Lady” with too many dogs running around in a crowded kitchen. Turns out, there’s a LOT more to it. And here at Arctic Spirit, we believe in using the talents of many to achieve the impossible. We need lawyers and financial experts to help us incorporate and set up a legal charitable organization. We need technical people to help with the website and social media, artistic people to help with logos, graphics and communications. We need fundraisers to help us pay for vet bills, administrative costs, and other expenses. We need crafters to help create fundraising wares, transporters, photographers, animal caregivers, veterinarians, groomers, event planners, administrators….the list doesn’t end. And of course, we will always need more foster families. That need will always exist! And we need them to all work together. At every step, as a volunteer organization, people have the opportunity to give of themselves, to give their talents and advice and time. Every piece helps complete the puzzle that is rescue, and every gift is important. We have seen many rescues function by a handful of people doing everything. They must be the experts in all fields. And they do save animals. But is that the best way? What if we could harness people of all strengths together, like a dogsled team harnesses together dogs of different strengths and capabilities to pull a sled Lead dogs, wheel dogs, dogs in between, and some guy (or gal) riding along on a sled to provide consulting advice? What if we consult with real experts on each step rather than thinking we know how to do it? What if we had people with all different gifts, each contributing their own talent and enjoying what they do? What if we could pull all those wonderful talents together, and work as a team to pull the sled? We decided we liked the answer: We can save a lot of dogs. But more than that, we can make a real difference in educating others in animal care. We can support other rescues, and other rescuers. We can make people’s lives richer, and help lift the burden in hard times. We can help owners saying goodbye to their beloved pets find peace. We can ease the suffering, and fear, that so many beautiful animals endure. We can bring hope and happiness and love to animals and humans alike. And like a dogsled team, we can have a lot of fun doing it! We Can Make a Difference – a big one. We believe we can only achieve our dream as a team, inspiring others to work with us in this dream. It takes a village. Everyone has a talent, just like every dog has a value. Only by combining our contributions, large and small, can we succeed. Come share your gifts, your talents, your time and energy. We don’t want to drain you. If we all play a part to pull this sled, we can all be amazing! You will hear us saying “It takes a village” and hopefully you won’t tire of that, because it is at the heart of what we see as the Arctic Spirit.